Pau Gasol's return from foot injury, University Foot and Ankle Institute. view another article... This foot condition is the new back pain — it’s everywhereCarestream, CurveBeam to spread word about weight-bearing CTNew Cartiva ImplantPain Free Plantar FasciitisUFAI featured on ABC NewsCarolina Panthers Star Lotulelei's Foot InjuryFoot Surgery InnovationsBiggest Opportunities for Foot SurgeonsDoctors TV Show - Foot Surgery while Pregnant10 Diseases Your Feet Can Reveal, Readers DigestPlantar Fasciitis TreatmentsThe Doctors TV, Living with Plantar FaciatiisHow to Stop Foot Pain for Good44 Ways to Correct Hallux ValgusDo fat-soled running shoes protect aging joints?Ankle replacement can restore mobilityCam Newton's Ankle InjuryMinimally invasive Foot & Ankle Surgery49ers' Crabtree 'amazing' Achilles recoveryAbout Kobe Bryant's Knee InjuryCurry more likely to play than Bryant3-D Scan Reveals Foot Damage by High HeelsAlbert Pujols' Foot InjuryWill Kobe Return? Doctors Raise Questions About Laker Star's Future In The NBAWhat Kobe must do to prove 'doubters' wrongKobe Bryant's difficult task ahead after injuryIs barefoot running a bad fad, or better choice?Born to Run Barefoot?Born to run barefoot? Some end up getting injuredCan a $15 basketball shoe have game? Dr. Bob Baravarian, foot and ankle specialist at Saint John’s Health Center in Santa Monica, explained that the tear Gasol experienced was "kind of like [Gasol] did his own minor surgery." The tear will relieve pressure on the plantar fascia once the traumatic pain and inflammation is gone. I spoke with two of the leading doctors in this field on Wednesday night and Thursday morning, giving more insight into what Gasol faces. One of the key points Dr. Baravarian explained was that this chronic issue goes beyond inflammation and becomes structural. "It goes from fasciitis, an inflammation, to fasciosis, which is chronic. These have different treatments. Anti-inflammatories don't work at that level." Dr. Baravarian said that the six week term quoted by the Lakers was "on the high side. Usually we see three to six weeks for something like this." The Lakers will be working to get the pain and inflammation out, as well as decreasing scar. He suggested PRP (platelet rich plasma) therapy would be indicated for something like this. One of the nation's leading experts on PRP is Dr. Mark Niedfeldt. Niedfeldt was part of a landmark study on plantar fasciitis as well. Dr. Niedfeldt agreed that PRP would be appropriate here, saying "he's already shut down." Niedfeldt was also positive on Gasol's comeback chances. "With proper arch support he may be able to get back in 2-4 weeks, but 6 weeks is not unreasonable, especially for basketball with all the pounding. After the acute injury settles down over the first couple weeks, sometimes people have less chronic heel pain." Pau Gasol is out for at least a month, likely longer, with one of the most painful injuries in sports: plantar fasciitis. 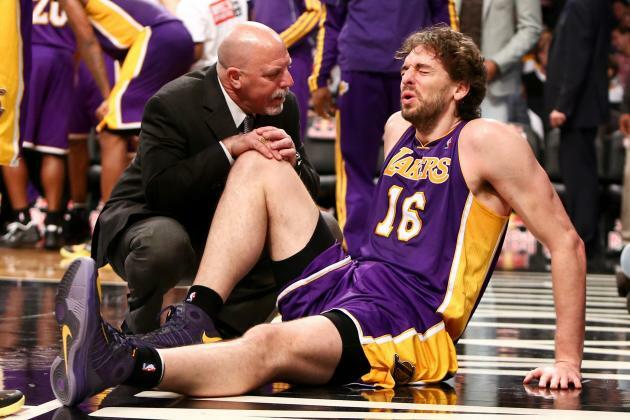 As Ken Berger of CBS Sports reports, images show that the fascia is partially torn, which, while not good, could have been worse: "Pau Gasol has a partial tear of his plantar fascia and is expected to be out at least six weeks, league source tells @CBSSports." A more complete tear would have meant Gasol was done for the season. This tear, said to be a mid-grade strain, is less than 33-percent torn. Anything further normally requires a surgical fix. The Lakers have said they expect Gasol to miss six weeks, though there is no evidence in their statement to indicate why they believe this to be. Surgery for the condition would take between 10 and 12 weeks of recovery time. Plantar fasciitis is a very painful and common foot injury. The plantar fascia itself (warning: graphic surgical image) is a long piece of tissue that goes the length of the foot, from the bones of the heel to the toes. It is what creates the arch in the foot. With inflammation, either from external forces or from spurs or other internal irritants, the fascia becomes painful. There are a number of causes and 10 times that many treatments, some of dubious value. You can't thumb through a SkyMall catalog without seeing 10 different therapies. For an athlete like Gasol, this problem is going to take more than a $69.95 shoe to wear overnight. The painful condition—and doctors and podiatrists agree that it is among the most painful conditions of the foot when it is at its worst—can come and go, but in Gasol's case, it has gone from a chronic irritant to a traumatic problem. If the fascia becomes too inflamed, the fibers can weaken or get pushed apart. That causes a loss of structural integrity and can lead to tearing. If minor, it merely increases the pain and extends the cycle. If if is major or is a traumatic breakdown of the tissue, then it becomes a surgical fix, in most cases. In the immediate future, Gasol will need extreme rest and will be on crutches or a CAM (Controlled Ankle Motion) Walker in order to take as much weight off the injured foot as possible. We probably won't have any indication until early March as to how the rehab is going. Look for Gasol to walk unassisted at about the three-week mark and to begin working with the team seven-to-10 days later. Gasol faces a long rehab for a painful condition. If things go well, he will get back in time for the playoff push the Lakers hope they are headed towards, but there's a big risk of setback.